What a ride! 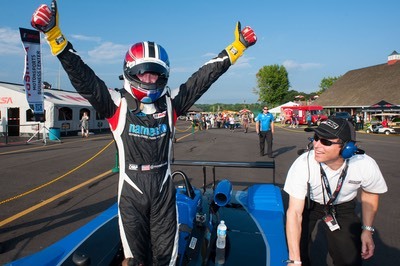 The Skip Barber National Championship presented by RACER has reached its conclusion. In my last e-mail I shared what it was like to go for and achieve victory. Since that time you all and others have sent me over 150 e-mail's of congratulations. It took half of yesterday just to read and reply them! I sincerely thank you all for your care and friendship. So then, as you haven’t heard the tale yet, we did one more race, Round 14 of 14, on Wednesday at Mid-Ohio. In the morning I was feeling like I had just won the biggest job audition of my life. With this new role, it was back to work to put on a good show for the people there, and for everyone else watching via the Internet. In Qualifying I had a feeling the car was going to be pretty low on grip to start out. We were almost a second off pace in the opening laps, struggling to carry corner speed in all the faster turns like Turn 1 and Turn 12. I just kept plugging in the laps waiting for the track to warm up and the tires to come up to pressure. Near the end of the session I put in my string of laps, all within a tenth of a second, and one flyer to secure Pole Position and a track record. A good exclamation point! In the Race, I started from Pole and held the lead for a lap. Cole Nelson passed 2nd place starter Jordy Vorrath and was right behind me. 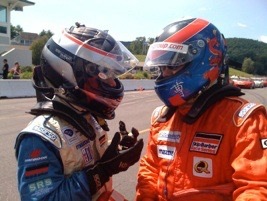 Cole and I traded the lead for about five or six laps, usually swapping in the brake zone of Turn 7. Nelson was on a mission to outscore Vorrath to take 2nd in the overall points. But Jordy was not about to concede! Half way into the race I was passed by Cole, and didn't see Jordy using both our drafts to get a major slingshot into the braking zone. Jordy went from 3rd to 1st in that corner, more to the surprise of Cole who was sure he had the lead. Those guys nearly hit at the apex, but their car control kept the contact at bay. They would do this near miss many more times into Turn 7. Meanwhile I would make my first big error of the weekend in Turn 1 and give a position to Matt Varsha, then to Garret Zine. There I was, in 5th place. I thought, okay, it doesn't matter where I finish, but it DOES matter that I do my best. So, enough errors, lets get back to work. As the race wound down, I found my way back to 4th place, then had a shot at 3rd, but Cole closed the door in the last turn (as I would have done to him) and I remained 4th at the finish. At the podium, wise cracks abounded, photographs were taken, but the real satisfying part was watching the top 3 race finishers chase our Pit Lane Coordinator - Randy Buck off the podium to soak him with our substitute champagne (bottled water). Our beloved Mr. Buck had cleverly kept the drivers under control all season long despite our whining and complaining that we were always DOP (down on power) or other malady we probably made up for an unfair advantage. After the race, season trophies were handed out by Divina Galica, our recently retired Senior VP of Racing, and by Bob Varsha, the SPEED Channel analyst who's son Matt Varsha finished 4th overall in points. One parent was so overcome by the emotion, he fell over backwards destroying a portion of our hospitality tent. And so ended the 2005 National season. What's next for Gerardo? 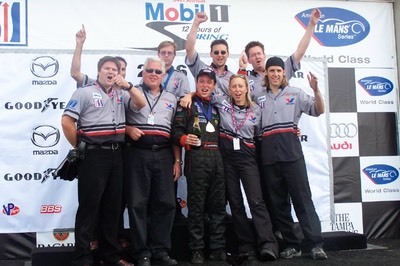 My 2006 season began the next day, Thursday, with calls to sponsors and teams. 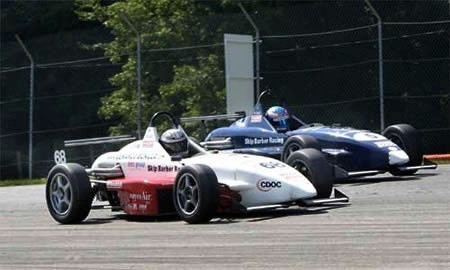 I'll most likely be in the Star Mazda series. 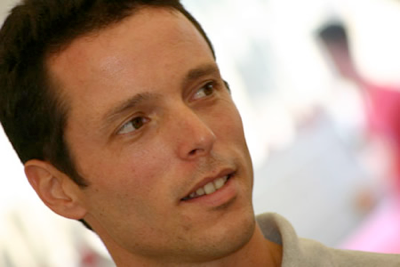 Of course, we are considering Atlantic, but Star Mazda is still a very compelling choice and probably the right step for a guy out of Formula Dodge. Look for an announcement in the coming weeks. Thank you all, once again, for showing me your care. You have all made me stronger, wiser, and better prepared. I see racing as a dream job. I don't see why anyone couldn't achieve their own dream job, whatever it may be. If somehow by doing what I do teaches others to do better with their own lives, then I may have discovered the ultimate satisfaction. 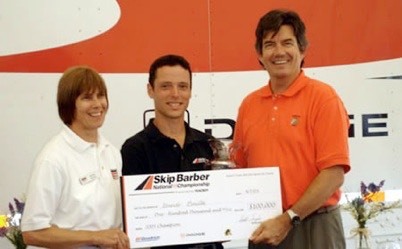 Thanks also to the Skip Barber company, for providing this championship opportunity and the $100,000 scholarship award for 2006. Thanks to the office staff, mechanics, instructors, series officials, and the corporate partners Dodge, BF Goodrich, and Quaker State, without whom the series would not be the quality driver training championship that it is. 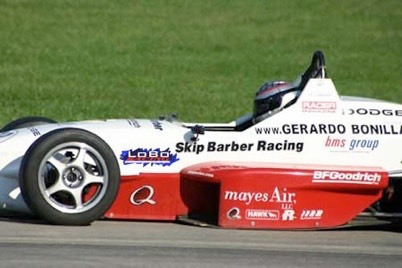 Thanks to the BMS Group (www.burrismotorsport.com) for marketing and promoting my career. Paradise Found! Gerardo clinches Championship! Today at Mid-Ohio I was presented with the opportunity of a lifetime. It was a chance to finally make good and finish what I've started and win an important drivers championship. 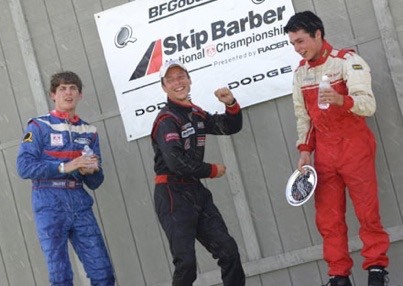 The Skip Barber National Championship drivers were ready for battle. Here's how it went. In the morning practice session the track turned out to be rather slick. These things happen, a little fog or mildew settles over the surface making the asphalt a bit of a skating rink. As our tires heated up, Matt Varsha went to the front of the timesheets in a big way. I drove my best and managed 2nd fastest time. Later on we qualified for Round 13. The track was in better shape this time around, giving us more grip in all the scary turns. Matt Varsha once again set the pace by blazing to a 1:34.413. I was having a really tough time making my car stick, but I somehow pulled out a 1:34.458, only 0.045 second behind. Garrett Zine showed speed he had not had all weekend by turning a lap at 1:34.505, only five hundredths off my time. Points contenders Jordy Vorrath and Cole Nelson would qualify 4th and 5th respectively. It was finally race time in the afternoon. At the green flag Varsha got a great start, allowing me to slot in right behind with nobody to my inside. In fact, I had a small opportunity to pass for the lead going into the first turn, but Matt denied that. It was not yet time. We settled into a torrid pace with Matt Varsha leading, myself in second, Jordy Vorrath in 3rd, and Garrett Zine in 4th. Cole Nelson quickly made short work of Garrett, moving himself to 4th. The mind-numbing pace of Matt Varsha was such that I could not make any mistakes, or else lose even more track position to his speed. Jordy was right behind and I could not let him pass. As the laps went on, Jordy began to fall back. Was this really happening? Before I knew it, Cole Nelson had demoted Jordy Vorrath to 4th. So it was now Varsha, me, Nelson as top 3. More laps went still at ludicrous speed, and it finally happened. Matt Varsha made a huge error in the 4th gear Turn 12 and nearly flew off the road. He held on, allowing me to catch right up to his gearbox. The bobble also allowed Nelson to tuck right behind the two of us up front. It was now or never to go for the lead, or risk Nelson demoting me. As we went through Turn 3 on the next lap Matt made another error. How lucky was I!!! I had the run and made the pass for the lead into Turn 7. Varsha now had Cole Nelson to battle as I pulled away. Oh my, was this really happening? Was I really leading with Jordy Vorrath (2nd in points) at least as far back as 4th position? More laps, more battling between Cole and Matt. They finally settled into Varsha 2nd, Nelson 3rd, and began to work to catch me. But it was too late. There was no way I was going to make any mistakes, and they had run out of time. On the last lap it was all I could do to see straight. I couldn't feel the steering wheel anymore. I forgot what gear to use in Turn 12. I yelled in my helmet to just drive whatever gear. I made it to the last turn, I had ignored the mirrors, and somehow, there was the checker flag. I had won my 4th race of the year! As I came into the pits, I was pumped. My fists were in the air, I had unbuckled my belts and was half standing still pumping in the air. I stopped, the mechanics dumped gallons of freezing cold icy water on me, and it all blurred out as someone whispered in my ear after an eternity that Jordy had finished 5th. With that, I about collapsed because I knew then I was CHAMPION. The monkey is off my back. I've learned how to win a championship, and I'm desperately hungry to do it again. We will race one more time tomorrow, and boy will it be fun. Then its back to work, we will have our sponsorship, we will have our investors, we will do the PR, the hospitality, the educational programs, the charity events, and we will win races next year. Thanks to my Mom and Dad for bringing me up strong enough to be a race driver. Thank you to this year's investors, who without their support, I'd be without this opportunity. Thank you to my past investors who put me in this position to begin with. 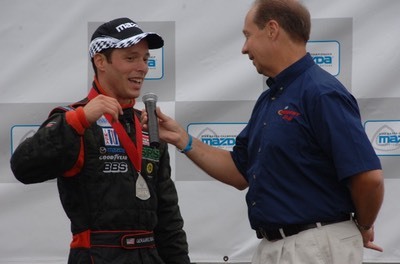 Thank you to Skip Barber Racing School for providing a venue to develop one's driving talents into greater abilities. Thank you to all my individual mentors. You have each taught me to be wise, strong, crafty, and fast. The list goes on and on, and I will thank everyone again. Again, we will race once more tomorrow for Round 14. It will be a nice way to close a really great year. 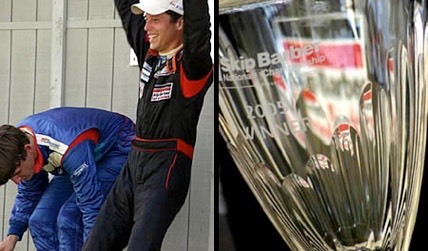 The Skip Barber National Championship presented by RACER has finally reached its conclusion. We have descended upon the Mid-Ohio race track for Rounds 13 and 14 of the 14 round series, the champion of which earns $100,000 in scholarship for 2006 competition. Oddly enough, we are racing during the week. Our first practices took place today, while Qualifying and the Round 13 Race will take place Tuesday, and then Qualifying and Round 14 will take place Wednesday. Mid-Ohio, for those of you who have not raced here, is a technical track. The corners appear quickly from one to the next with minimal straightaway in between. Because of the frequent corners and elevation changes, the driver's performance becomes a little more important than on a "power-track" that might reward stronger cars. You might say I really like this type of challenge. I am very highly focused now. Sometimes the driving is like autopilot, while other times I work on specific problems at certain corners. The sessions, which are 35 minutes long, feel as if they are 10 minutes. The day, normally 10 hours at the track, feels like only 2. Am I in the zone? You bet. 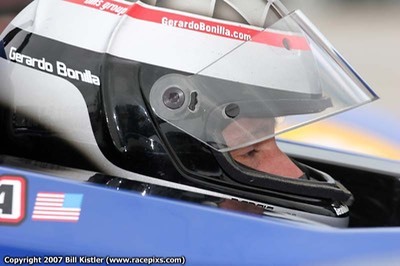 Here are today's times, along with a link to a recent article by Rick Roso at SkipBarber.com. Huge thanks to my legion of friends who participated this past weekend in the Skip Barber Regional Series and Masters National Championship. Every time you guys gave me a pat on the back, it made me stronger for what I must now do.